The Comsol Group is at the cutting edge of research and engineering simulation. It specialises in multiphysics modelling, and its simulation software is used by those working on a vast range of innovative scientific and engineering endeavours. Comsol customers work for technical organisations, universities, and research laboratories. They produce simulations to make aircraft and cars safer and improve fuel efficiencies; develop medical equipment to enable more accurate diagnoses; explore the universe, and educate the next generation of scientists. It’s a diverse marketplace for a range of specialist research areas. The company was founded in 1986 and in 1998 the first version of its flagship product, Comsol Multiphysics, was released. The product line has expanded over the years to include a suite of discipline-specific add-on modules for a range of physics areas, including structural mechanics, high- and low-frequency electromagnetics, MEMS, acoustics, and chemical reactions, to name a few. The software may also be integrated with CAD packages, as well as Matlab and Excel. Comsol now has a user base of more than 100,000 scientists and engineers. 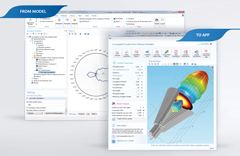 The latest release of the Comsol Multiphysics software introduced an ‘application builder’, which makes it possible for experts to add customised user interfaces to the multiphysics model that they developed and verified. It’s an important step, as the Application Builder removes the feature-rich technology from the simulation and allows users with little knowledge of the simulation world to interact with it. The application builder allows users to ditch detail-oriented tools and to fashion a more approachable application, or app, that is intuitive and easy to use. For example, the app creator can build a simple interface that holds an assortment of buttons, menus, lists, graphics and text to make the operation of a simulation as straightforward as possible. The application builder relies on the Comsol Server platform to distribute, manage, and run simulation apps. Comsol Server gives modelling experts the choice of launching an app from within the Comsol Multiphysics environment, or of running the app as a standalone application on a desktop-installed client, or within a web browser. This makes the application builder a highly accessible and versatile tool for the wider academic and engineering community. It gives users real-time, live examples of modelling and simulation results, rather than a static chart or graph. This is a great communication tool for demonstration purposes and educational outreach. The application builder is essentially building a bridge between the modelling expertise of the simulation expert and the scientific and engineering expertise of the app users. There are many ways in which the application builder could be used more efficiently to communicate complex design ideas across multiple simulation and process departments, and to allow app users easily to explore the outcomes of proposed designs. One such example is the work done by researchers at the Manufacturing Technology Centre (MTC) in Coventry to communicate their work into an additive manufacturing technique known as shaped metal deposition (SMD). SMD deposits a series of sheets of molten metal, layer by layer, to slowly build up a surface in a process similar to welding. Thermal expansion can deform the cladding as it cools, so such deformations must be kept to a minimum. MTC built an app using the application builder to allow users to experiment with the deposition process. Geometries, heat sources, materials, and deposition paths can all be altered using the app to test whether a viable end product is produced. The app allows an end user, who is oblivious to the underlying model complexities, to test the system for specific customer needs and projects. There is no need to call on modelling experts to run simulations, freeing up their time while allowing end users to interact and thoroughly test the system to their heart’s content. Comsol recognises that its software will be used by the world’s most advanced organisations and individuals to produce devices and processes, which poses another challenge for the company. ‘Last, but not least, we need to help all these experts work in concert to produce useful, reliable, products and services. Because R&D and production costs are high and failure can be catastrophic, product requirements, as well as expectations, are extremely high,’ Littmarck added. The application builder matches these expectations by opening up the doors of multiphysics simulation to the wider technical community, allowing more users to interact with, understand, and test the simulations that were previously the sole domain of a handful of simulation experts.